An electric boiler relies on electricity to generate heat, and they can be highly effective at warming a home or a home’s water supply. The average costs of an electric boiler can range between $300 to $2,980 in total. 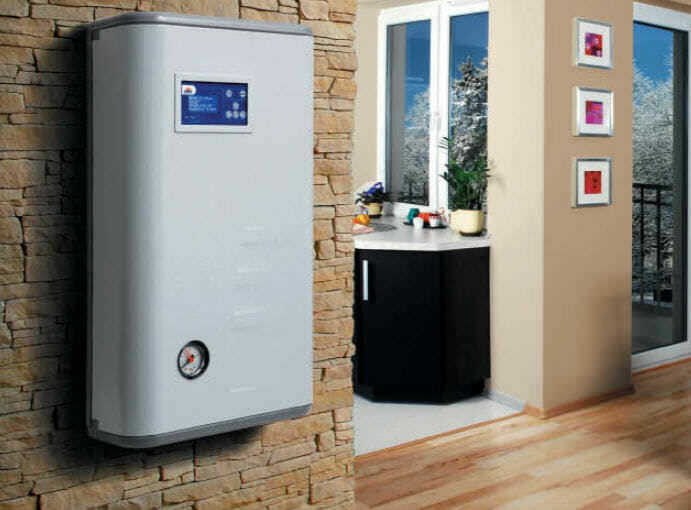 An electric boiler is a large water tank with an inlet and outlet. Within that large tank is an array of electric heating elements. Electricity comes from the main power supply of your home and passes through those heating elements to warm up to very high temperatures. When those electric elements are heated up, water passes over them and warms up as well. When the water reaches a high enough temperature an electric pump moves the water from the boiler through the outlet to the rest of the house to run through radiators. The inlet takes in cool water from the home to be warmed up by the boiler before being sent out once again. Gas boilers can be quite expensive to put in, especially if you don’t have a gas line running through your home already. Running a gas line is a big undertaking that you will pay dearly for. Fortunately electricity is run to most homes today. That means that an electrical line won’t have to be run to your home in order for you to get an electric boiler working. It will simply have to be wired up to existing lines and you can benefit from the solution almost immediately. This means that electric boilers are more affordable to have installed and you can expect to receive lower quotes for such an installation compared to the other options available. Electric boilers are more efficient than boilers that run on natural gas because no exhaust flue is needed. When gases are burnt some waste gas is produced and this has to be released out of the home. Along with those waste gases that are released goes some of the heat from the boiler as well, this is wasted energy. Since electric boilers don’t creates waste gases no flue exists and nearly all the created heat is used heating a home. This allows electric boilers to be up to 99% efficient, a number that isn’t possible for most fossil fuel solutions. Electric boilers can be positioned most anywhere that you like in your home because they don’t have a flue that has to be put up through your home and they don’t have to be set near an outside wall either. Instead they can be positioned in the center of your home, or anywhere else that you like really. The boiler also doesn’t need a fuel tank like oil or propane units do. That means you’ll save space that would be dedicated to fuel as well. You won’t have to worry about a gas leak in your home when you rely on an electric boiler. These units are very safe and can be put in more areas around your home for this reason. They aren’t as difficult to install and you will feel secure that your system is going to provide you with the heat you need without causing any problems for you. Electric boilers are very easy to maintain. There are no burning gases and there is no residue buildup over time to clean away. Instead you have a very clean solution and the only real maintenance that has to be done is cleaning out debris brought in from the water that runs through the system. Electric boilers generally require less maintenance than the other types for this reason. Electricity is simply more expensive than gas in most parts of the United States and Canada. That means by relying on electricity to heat your water and your home you’ll be spending more money, even if your unit is using the electricity more efficiently than a gas boiler would be using gas. You will spend more to generate the same amount of heat in most instances. Electricity-resistance heating doesn’t offer as much heat as burning gas does. That means that you won’t be able to generate enough heat for your home if your heating needs are large enough, at least not without some serious power line modifications and potentially installing multiple boilers. If your home is larger or you require a lot of heat you might have no choice but to rely on gas to get the job done. If you lose your power you lose your heat and/or your hot water when you rely on an electric boiler. That’s not the case with many fuel boilers and you could continue enjoying heat even when the power is out with the proper setup. Electric boilers are an affordable option up front and they have a lot of real benefits compared to gas boilers, but they also come with some downsides. You’ll likely spend more to heat your home over time, and you may not even be able to produce enough heat for your home with an electric boiler. That being said, for some people the benefits outweigh the downfalls and an electric boiler simply makes sense.